Additional Info: Patio doors on to decked area. Rotary clothes line. Selection of board games, DVD's and books. Hair dryer. A non refundable deposit of £100 is require within 1 week of completing your booking with the balance due 6 weeks before your stay. For last minute breaks full payment is required within 1 week. Payment by bank transfer. £50 refundable damages deposit. Please include the number of guest, (adults/children/dog), and if you require the travel cot, high chair and bed guard. Our Sheraton has two bedrooms, the master has a double bed with and en-suite toilet. 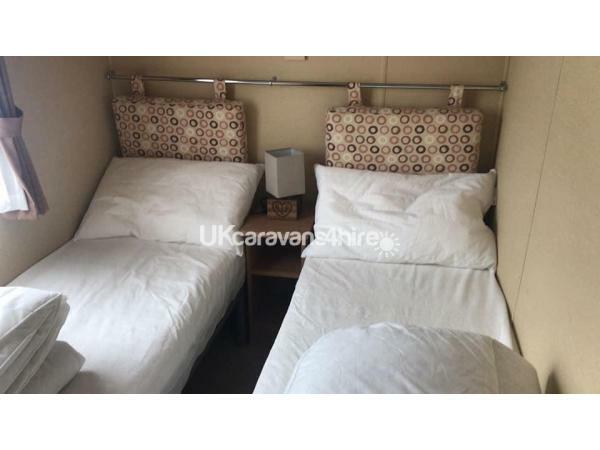 Bedroom 2 is roomy with twin single beds. The lounge has a pullout double sofa bed and is separated from the kitchen with a door, ensuring you don't disturb any guests when making your morning coffee. The bathroom has a full size a walk-in shower and toilet. 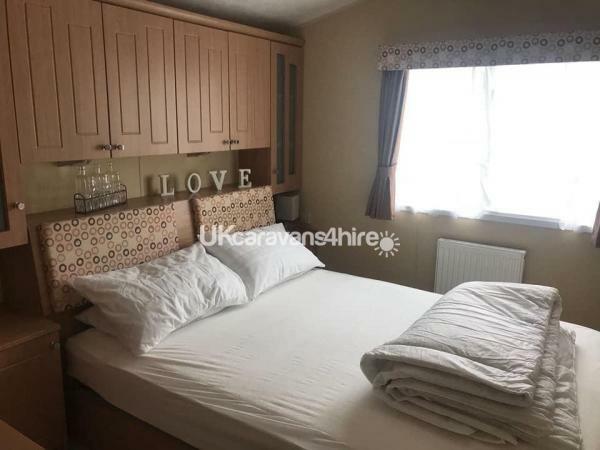 The kitchen diner boasts a full size fridge/freezer, 4 hob gas cooker, microwave, 4 slice toaster and kettle, as well as an ample selection of pots, pans, cutlery, and utensils. A hair dryer, iron and ironing board are also supplied. A small supply of basics (tea, coffee, loo rolls etc) will be there on arrival. There is free view TV plus a selection of DVD's, games and books on hand for those family nights in. For our smaller guests a travel cot, high chair and bed guard can be on hand ready for you (please request), plus you will find children's plates, bowls, tumblers and cutlery in the kitchen. Access to the secure decked area is via the patio doors only, where you will find a table and chairs for you to enjoy a sundowner or 2. A rotary clothes line is situated on the lawned area next to the dedicated parking space. We provide duvets, pillows and mattress/pillow protectors, but please bring your own bed linen and towels. Electric and water are included. Gas is metered, and is topped up via key card which can be purchased at reception. There will be units on the meter when you arrive, we do ask that you leave the same amount when you check out. 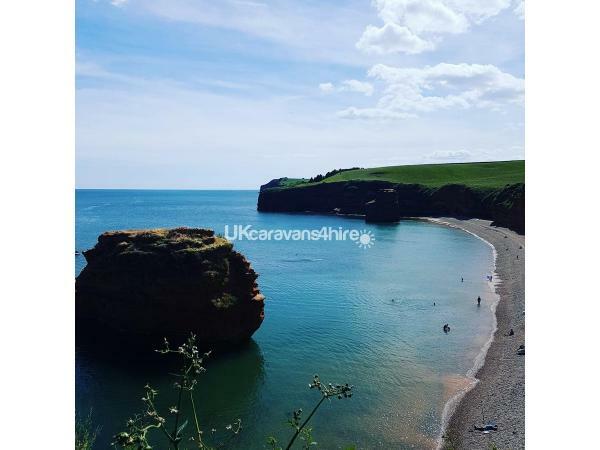 Ladram Bay Holiday Park is a Diamond award winning park with excellent amenities for both adults and children. 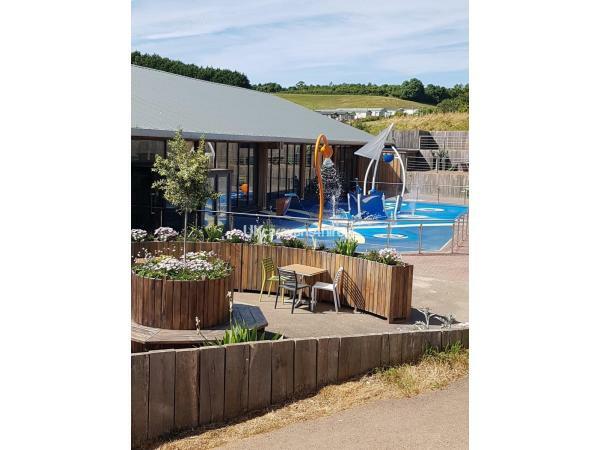 The park has a wonderful pool complex*, including an indoor heated swimming pool with a shallow childrens area with slides and fountains. Newly opened this year is an outdoor splash zone. The pool complex also has a sauna, steam room and gym. A private pebble beach awaits you where you can hire fishing boats, kayaks and paddle boards. An outdoor play area, indoor soft play, amusement arcade and crazy golf will keep the kids entertained for hours. *Pool complex passes need to be purchased at reception. There is a well-stocked shop, restaurant and bar, coffee shop, takeaway, launderette and internet zones. Included is nightly entertainment in the clubhouse with kids club followed by an array of acts. We accept 1 well behaved adult dog per rental. 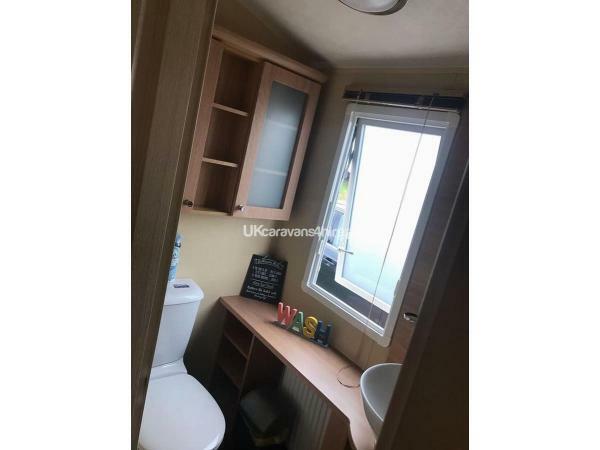 If you are looking for 2 (or 3) caravans next to each other please check out our next door neighbour user ID 2229 and his neighbour User ID 129. Thank you for your review John. Glad to hear you enjoyed your stay with us. Home from home. Extremely comfortable caravan and everything we needed . Best shower we have ever had in rented accommodation. Owners so caring and considerate and easy to contact if needed . Booked straight away for October and April next year . Our new found perfect escape . Clean , comfy and very good value for money . Thank you for your review Tracey. We are so pleased you all had a wonderful stay and we look forward to welcoming you back for your repeat bookings. Thank you Joanne. We are glad you had a fantastic stay and the little touches made your holiday easier.